Jan 15 2009: V.I.P. Pancreas R.I.P. We'd like to take a moment to say goodbye to a very important pancreas that may very well be on its way out -- Apple's co-founder and CEO Steve Jobs may have to have his pancreas removed in order to halt growing problems stemming surgery he had a few years back to get rid of cancerous tissue. Apparently the pancreas' oozing enzymes can cause trouble for surrounding organs, so the best way to stop future spread of cancer and growing problems with surrounding organs is to take the ol' thing out. Those of you with diabetes and pancreas trouble will sympathize with his future regimen of insulin and digestive enzymes. 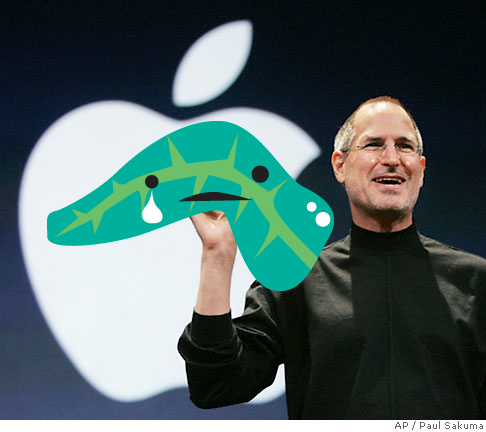 We must give thanks to Jobs's pancreas for taking him along in life this far in dutiful service to its owner. Thank you, Mr. Pancreas, may you rest in peace.